The film is a visceral, organic experience, with landscape and action inextricably intertwined from the outset. We first hear the wind as it whistles down the camera, which then opens in tight focus on a horse as it moves in slow motion, breathing heavily, kicking up the dust. Suddenly, a young man sits bolt upright in bed, awoken from his equine nightmare. He is, as the title tells us, The Rider. Or he used to be. As he removes the bandages from his head to reveal a substantial wound, the scar still jagged and raw, it’s clear that 20-something Brady Blackburn (real-life former cowboy Brady Jandreau, who Zhao met while making her 2015 debut Songs My Brothers Taught Me) is in no state to do much of anything, let alone ride. And for a young man living in the heart of the South Dakota Badlands that means that he has not only lost his income, but also his identity. Worse, he has lost his masculinity. As we can tell from the offhand way he treats his injury — wrapping it in cling-film before taking a shower and venturing outside for lasso practice — Brady has a obstinate spirit that sees him vow to return to the sport that almost killed him; rodeo. As much as he tries to do the right thing — care for his beloved sister Lilly (Lilly Jandreau), who has learning disabilities, or help with the rehabilitation of his best friend Lane (Lane Scott) who suffered severe brain damage during a rodeo fall — the pull of the ring stays strong. That’s as much to do with external pressures as it is has with Brady’s own adrenaline junkie-ism. In this spit-and-sawdust environment where men are defined by their foolhardy fearlessness, Brady is now unsure of his place. This is beautifully evidenced by a campfire chat in which Brady’s friends — many of them withtheir own scars, and all of with their own injury stories — tell him, with rough-hewn affection, to get back in the saddle. While such bravado skirts close to the realm of toxic masculinity, it is an attitude buried deep in the soil and, as much as it’s a curse for Brady, it’s also something of its own balm. Perhaps, if it weren’t for the jibes of his peers and his well-meaning father Wayne (Tim Jandreau), Brady would have less of the defiant spirit that undoubtedly helps him to heal. That Zhao is a Chinese woman, (she was born in Beijing, but now lives in California) perhaps gives her the cultural remove needed to explore the ideological grey areas of this well-worn, overtly masculine genre. Yet that’s far too simplistic an explanation for the level of craft on display here. The strength of her approach is in her expert walking of the line between fact and fiction. While she’s working with real life characters beautifully playing versions of themselves, and has crafted a narrative that rings with emotional truths (indeed, the film is strongly reminiscent of Lucy Walker’s 2013 documentary The Crash Reel, which dealt with brain injury among snowboarding’s elite), she also takes time to bask in the western’s cinematic heritage. Her expert partner in this is cinematographer Joshua James Richards, who last year turned in some stunningly evocative work in British farming drama God’s Own Country. 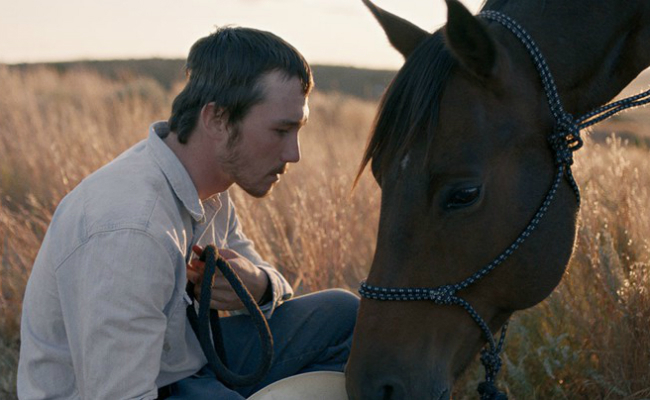 He does the same here: framing the landscape in breathtaking traditional widescreen, the rolling hills and pink-hued skies suggesting limitless possibility; following Brady as he takes beloved horse Gus on one exhilarating final ride; capturing the colour and cacophony of the rodeo. Then, by contrast, he closes in tight on Brady’s scar, his anguished face, the beige, cramped interiors of his family’s trailer, the sterile, impersonal lines of Lane’s treatment centre. Real life, son, ‘aint like the movies. Heroes sometimes fall. And this is not only Brady’s lament, but that of an entire way of life. South Dakota used, once, to be the frontier, the cutting edge of possibility. Then it became America’s heartland, a stable, dependable environment. Now it’s a place of economic and social quicksand where, if they are not scratching out a living with horses, people toil in decaying beer joints and gas stations. Here, rodeo stardom is not just a folly, it’s employment and escape — and the only one likely for local youngsters. When Brady finally sees sense and abandons his last-ditch attempt to return to the saddle, he goes straight back to Lane to watch old rodeo movies of the two of them in glorious action. It’s a bittersweet moment, an acknowledgement both of triumphs past and a happy ending that, for many, will never transpire.